In the following interview, “Mobile Design Pattern Gallery” author Theresa Neil (@theresaneil) discusses interface design trends, the one app design mistake that pops up again and again, and the apps that get UI right. 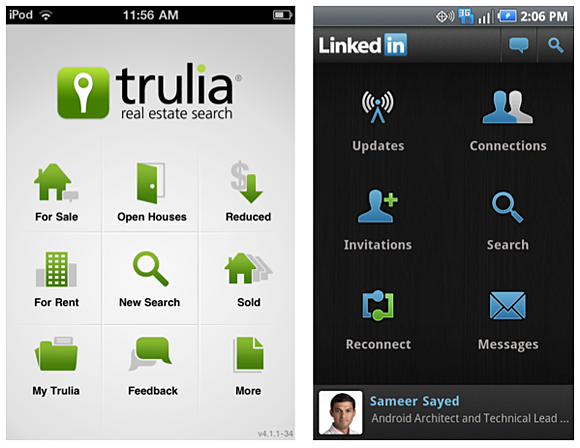 What are the most interesting trends you’re seeing in mobile interface design? Theresa Neil: I’m most interested in the trends that arise when app makers try to address a cross-device design strategy. For example, the Springboard pattern — a grid of icons acting as a launchpad — is a popular navigation pattern since it is “OS neutral.” Meaning, it doesn’t rely on bottom tabs like iOS and BlackBerry, or on top tabs like Android, Windows Mobile and Symbian. The Springboard pattern can be easily adapted for each operating system without feeling foreign or weird to the user. Your book includes UI “anti-patterns.” What are those? Theresa Neil: Anti-patterns are examples of mobile UI design patterns to avoid. Bill Scott, my co-author of “Designing Web Interfaces,” has had a popular talk for many years featuring anti-patterns in web applications. We could just write off these examples as bad designs, but I think it is important to dig into them and figure out why they are bad. What is the most common mobile UI mistake? Theresa Neil: Anti-pattern no. 1 is “novel notions.” Novel notions refer to designs that use a “novel” approach to a problem that could otherwise be solved with an existing pattern, a standard UI control, or a better metaphor. This is not to say designers should dial back their creativity. Apps like Flipboard, Path and Clear have blazed a trail with novel solutions to navigation. But novel designs need to be rigorously tested and refined before being released. Just look at the reviews in the App Store: For every awesome app like Path, there are dozens of other apps that are rated one star for bad navigation or a confusing interface. Which mobile apps have notable UI design? Theresa Neil: Flipboard, Path, Clear — the typical superstars. But I also love Evernote, Trip Journal, Foursquare and Fring because these companies have done spectacular work with their app design strategies. For example, look at Foursquare on a BlackBerry, iPhone or a Windows 7 phone; the apps are optimized for each of the different operating systems, but they still feel like the same app. Mobile Design Pattern Gallery — This book provides a reference to 70 mobile app design patterns, illustrated by more than 400 screenshots from current iOS, Android, BlackBerry, WebOS, Windows Mobile, and Symbian apps.